The Electricity Supply Corporation of Malawi (ESCOM) Limited has revealed that it will be adding 21 Megawatts (MW) of solar power to the national power grid. This was revealed at a Power Purchase Agreement (PPA) signing ceremony in Blantyre where ESCOM signed the agreement with a solar power producing company, Phanes Energy Renewables Nkhotakota Limited. ESCOM’s Chief Executive Officer, Dr. Allexon Chiwaya, said that the power company is implementing a road map that will enable it deal away with power blackouts through a sustainable energy mix. “The signing of a PPA with PHANES ENERGY RENEWABLES NKHOTAKOTA LIMITED which will develop a solar powered electricity generation plant in Nkhotakota District is a continuation of our road map. We will soon sign agreements with Independent Power Producers that will be producing power through gas, waste and coal.” Chiwaya said. Speaking at the function, Phanes Energy Renewables Nkhotakota Limited Head of Projects, Mr Alessandro Ortu, said the signing of the PPA is a big milestone in the implementation of the project. He further said that work has already started at the site where the solar power plant will be located. “We have already started clearing the site. Work will continue and we expect to have the solar power station ready four to five months from now,” Ortu said. 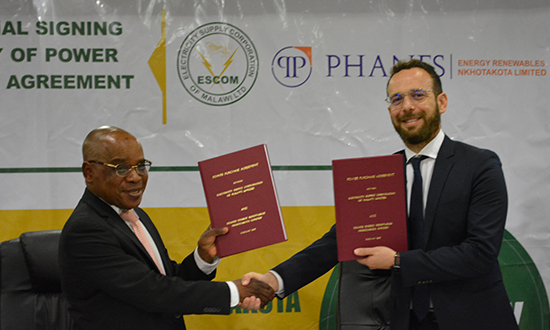 Phanes Energy Renewables Nkhotakota Limited has become the third company to sign a power purchase agreement with ESCOM in the last six months. In September 2018, ESCOM also signed PPAs with JCM Matswani Solar Limited and Mulanje Hydro Limited, two companies that will add a total of 88MW through solar and hydro. DONE DEAL! ESCOM CEO, Dr. Allexon Chiwaya and Phanes Energy Renewables Nkhotakota Limited Head of projects, Mr Alessandro Ortu, shake hands after signing the 21MW Power Purchase Agreement.